Since yesterday was Thanksgiving, I thought I’d share recipes for the things I made that I’ve not posted before. We had a couple of repeats this year, including Apple Stuffing and Pecan Pie. But the rest of the meal was made on our Traeger. It was a little rainy, but my husband just pulled it under the eave a bit with just the smoke stack sticking out and it worked great. Although turkey is traditional for the Thanksgiving Day meal, I’m the only one in our house who really likes turkey a lot and so even a smallish turkey is too much leftovers for the three of us. I thought about getting just a turkey breast, but we like the dark meat best. So I decided on a bone-in spiral ham. I love this kind of ham because it is so easy to serve, all neatly sliced and ready to go. 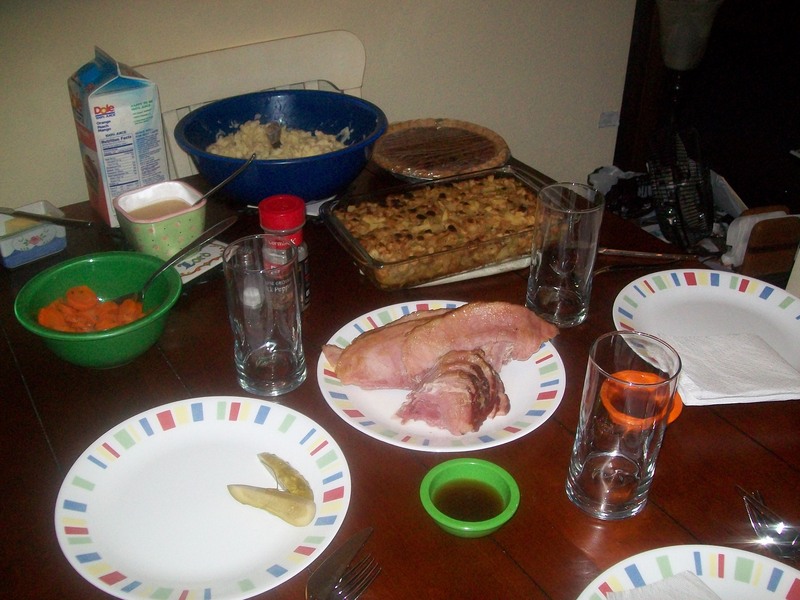 We also made mashed potatoes with potatoes cooked on the Traeger, and had Traeger-cooked carrots for our vegetable. And last but not least, I made ham gravy, which I’ve never made before but it turned out pretty good. Remove ham from packaging and place in a 13″ x 9″ baking dish or roasting pan. Spread apple sauce over the top of the ham. Cover with aluminum foil. Bake at 275° for 15 minutes for each pound of ham. (We “baked” ours on our Traeger pellet stove because I wanted to be able to use my oven to make the stuffing, which had to cook at 350°.) Remove foil for the last 10 minutes of baking time and drizzle with honey or honey glaze packet that came with the ham. Remove from pan and serve. Note: The number of potatoes for this recipe depends on how many people you are going to serve or whether you want to have leftovers. For our Thanksgiving Day dinner, I used 2 large russets and 3 medium white potatoes because that is what I had in the house and I wanted leftovers. If you are cooking at 350° the potatoes take about 30 minutes. If you are cooking at 275°, as I was to accommodate the directions for my ham, then these take about an hour. Pour potatoes from the aluminum into a large mixing bowl. Add milk, more than you would if you were making mashed potatoes from boiled potatoes because all of the starch is still in the potatoes and there is no added moisture from water. Hand mash until creamy, adding more milk if the mixture is too thick. I used at least ½ cup milk for my 5 potatoes. In a small saucepan, melt butter on medium heat. Add flour and stir to make a roux. Continue stirring and let the roux bubble a bit, and sprinkle in a little pepper. Slowly add juice from the ham, stirring with a wire whisk. Stir constantly as the gravy thickens, then slowly add water, stirring to desired consistency. Note: DO NOT add any salt to this gravy. I know it seems like everything needs salt, but this gravy does not because the ham juice is plenty salty. This entry was posted in Recipe and tagged Baking, Cooking, Eating, Family, Food, Gratitude, Gravy, Ham, Ham Gravy, Life, Love, Mashed Potatoes, postaday2011, Recipe, Recipes, Spiral Ham. Bookmark the permalink. Looked up Traeger, but I salivated on the mention of your meal. Linda, I’m so blessed when you share recipes. And blessed that you don’t do a turkey either. I’m the only one who likes turkey too, so just go with the flow of what others here will eat! Thanks for sharing your goodies of the day with us! God bless you and yours and your thankful heart!